← Why his autism made me a better person, and why I should never say that it has. Book Review: “Unwritten Rules of Social Relationships,” by Grandin and Barron. 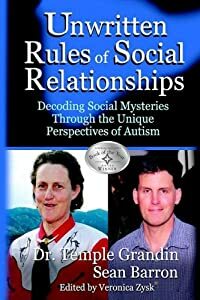 “Unwritten Rules of Social Relationships; Decoding Social Mysteries Through the Unique Perspectives of Autism,” is written By Temple Grandin and Sean Barron, with input and editing by Veronica Zysk. This is a remarkable book. It is quite unlike any other autism-related book I have read. It is challenging, confronting, and important. I’m going to try to explain why I highly recommend this book, and to which part of the population. Through the use of multiple voices, there is the chance to appreciate and understand the diverse experiences and perspectives of those with autism. Both Temple and Sean have autism, but their internal lived experiences of autism are very different, with Temple being highly logical and Sean being highly emotional. Though they come from such different perspectives, autism created the same group of social challenges in their lives; reading about those different experiences of the same challenges, creates one more tool for better understanding where your child’s (or your own) issues arise and how to best deal with them. Even the initial high repetition in the book serves a purpose: Repetition is a key method of learning for autistic individuals, and this book is as much aimed at them as at therapists, teachers, and parents. It also helps to generally drive home the points made. What this book has to offer, is of benefit to a wide group of people. It is going to be of most use to those who work with people who have autism, and autistic people themselves, if the autism at issue is of the high-functioning variety, where the individual is “advanced” enough for social relationships to be a key and perhaps the key issue in the person’s life. Having said that, related barriers of anxiety and sensory issues are also frequently discussed and put into the broader context of how they can impact on social success. The use of medication in teenagers and adults also comes up a lot, again in regards to how it can ease the road towards better social relationships for some autistic individuals. As a parent, I do suggest getting and reading this book to help you better understand your autistic child, well before they become autistic teenagers and adults. As the book emphasizes, the skills needed to do well socially, can and should be identified and taught from a young age, and most especially before adolescence when many social issues become more intense. The book is useful to a much wider audience too. It will be eye-opening for those unfamiliar with autism, and will be useful to those who struggle with social skills quite independently of any link with autism as a condition. The message that everyone should be taught social skills and coping strategies, is one quite rightly emphasized a number of times in the book. There are more lessons to be learnt from this book than I could do justice in a review, but there are a few I want to briefly introduce, to show you how valuable this book is as a resource. First, recognising the difference between teaching a child (and expecting them to understand) social behaviour, versus expecting them to understand the emotional relatedness behind / attached to that behaviour: It is important to learn and know social rules if you want to succeed at school, at work, and in relationships (and generally have a happier and more successful life). Those rules can be taught without requiring someone to also grasp the “correct” emotion behind it and to experience the right emotions for the social situation. Conflating the two together can overcomplicate the teaching task, and potentially set the child (or adult) up for failure. I found that point very insightful and important, and very obviously underappreciated in many situations I have seen and read about when it comes to teaching social skills. Some other interesting points made throughout the book, that I found particularly helpful to read about: The importance of teaching an autistic child that everyone makes mistakes; that rules are not absolute (but are rather situation based); and the division between public and private behaviour. Those are just three of the “ten unwritten rules” that guide the book’s discussion. Reading about these levels of anger and the fact that they frequently are a result of social challenges and “attribution error,” has very much improved my understanding of what I am encountering when I come up against this very aggressive hard-line attitude online. It’s also helped me understand that I am better off walking away from people caught up in that level of hatred, rather than attempting to engage and change minds, no matter how good my intentions; helping them is beyond my level of expertise. I need to focus on helping my own son, not least of all to try to avoid him taking on an understanding and view of the world that would similarly leave him vulnerable to such destructive anger. Don’t expect this book to offer you miracle solutions (there are none), or give you a step-by-step guide to fixing the social skills issues. What it will do is help you to understand and identify the challenges, and suggest some methods and further reading to find those solutions. What works for one autistic individual, may not work for the next, and that is part of the value of the multiple writer format of this book: The multiple perspectives and experiences that helps you to understand both the diversity, and the similarities in autism. The last message I want to share with you from this book, is an important one, and again is reinforced throughout the text: Social skills are a life-long journey. It can be hard to gain them, hard to use them, and the journey never ends; there is no “end point.” But the rewards for trying and achieving social skills, can be life-changing, in more ways than I previously understood. This book will change how you view social skills, it will give you insights to your child and yourself. You may not like everything you read in it, but you will learn from it, in ways that I think are incredibly helpful and hopeful. Gallery | This entry was posted in Parenting an Autistic Child, Resources for Parents, Reviews, Social skills and tagged anger, Aspergers, Autism, behaviour, book review, emotions, Sean Barron, social skills, Temple Grandin, The Unwritten Rules of Social Relationships: Decoding Social Mysteries Through the Unique Perspectives of Autism, Veronica Zysk. Bookmark the permalink. 5 Responses to Book Review: “Unwritten Rules of Social Relationships,” by Grandin and Barron. There is a wisdom among autistics that can’t be outdone. Reading about the levels of anger is very interesting. I needed to hear that. Maybe it’s time to go pick up the book! Iris Johansson’s book A Different Childhood is also an illuminating example of how one autistic person had to work and continues to work on being “normal” by learning the social rules and figuring out how to apply them in daily life. As the Grandin book points out this is a life-long task for Johansson as well. The excerpt below illustrates the kinds of information she had to store away in her memory banks and have available when the situation called for it. Interesting excerpt, thanks for sharing that Karl. I’ve always sensed a dichotomy within the “social skills”. mantra. What is it that is good about the social skills side of autism? I have to say, this book will be beyond helpful for those with serious social relating problems. I have no diagnosis of my own, but I am having a very hard time, I guess my whole life, managing and maintaining healthy relationships. I was absolutely losing control and watching, helplessly, my loved ones slipping away from me yet again when I read the bulk of this book. I am a smart, compassionate, friendly person who has made it okay in life to almost 30 so far… this book opened my eyes, and I have used the information to start mending some relationships. I was running out of all my emotional support, and things were getting desperate. There ARE no miracle solutions in this book, but I’d argue that some of these simple, 1 sentence Rules make a good step-by-step guide for some. Loved the book myself!